Chocolate is a food preparation which is made from roasted and ground cacao beans. It is typically sweetened and eaten as confectionery or used as a flavoring ingredient in other foods. Chocolate contains substances called theobromine and caffeine which come from the cacao bean. The cocoa trees load up the cocoa beans with these substances in order to protect the cacao bean from being eaten. While our human body is capable of detoxifying and removing theobromine and caffeine, to insects and wildlife, these substances can actually be toxic. Theobromine and caffeine originate from the cacao bean. 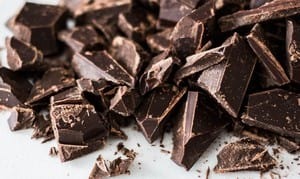 As a general rule, the more cacao the chocolate contains (typically the darker chocolate), the more dangerous it is for certain animals. Dogs and cats are well known pets that are susceptible to chocolate poisoning. But chocolate is also toxic to livestock like calves, goats, and ducks. In a first stage, the digestive system is affected, leading to vomiting and diarrhea. As the condition progresses, the central nervous system is impacted, first causing seizures and eventually death. Conclusion: never feed ducks chocolate! Did you know that chocolate should not be fed to ducks? We’re curious to find out.